Soluble Sounds – Expand Your Avocado Maan! 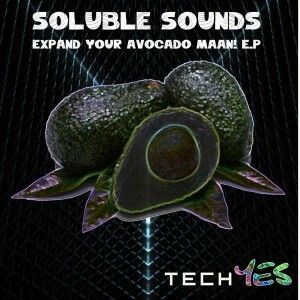 Bristol-based label TechYES returns with their third release, a solo effort by Welsh producer Soluble Sounds inviting you to Expand Your Avocado Maan! This release is an absolute stomper, featuring a rowdy mixture of psychedelic breaks, bass-heavy wobbles, and galloping progressive grooves that will set the dance floor on fire. All tracks written by J. Warwick with mastering and Artwork by Colour at TechYES Studio, U.K.
MP3 Download | FLAC Download | WAV Download · Download count: 7,487. THIS IS THE BEST EP I HAVE EVERRRRRR HEARD. Aw Yiss! Give me more of da wobble pls! !